Eight of the key issues that are of greatest concern for Aboriginal people in Canada are complex and inexorably intertwined - so much so that government, researchers, policy makers and Aboriginal leaders seem hamstrung by the enormity. It is hard to isolate just one issue as being the worst. 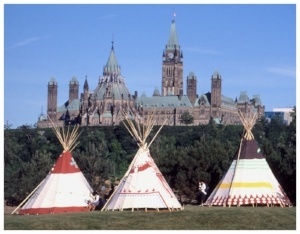 The Indian Act greatly contributes to these eight issues and more. And read this article 21 things about the Indian Act, if you want to know the intent and extent of the Act. Colonialism accounts for many bitter, demoralizing legacies, the most pervasive of which is education - the root of this particular legacy is that ultimate national experiment in assimilation - the Indian Residential School system. According to Statics Canada's 2011 Aboriginal Survey, 22.8% of Aboriginal Peoples had completed high school and post-secondary education. In 2010, the median income for Aboriginal peoples was $20,701, whereas the median income for non-Aboriginal people was $30,195. The earning gap between Aboriginal workers and non-Aboriginal workers shrank between 1996 and 2006 but, according to The Income Gap Between Aboriginal Peoples and the Rest of Canada, if the gap continued to close at the current rate it would take 63 years for it to be erased. In 2015/2016, Aboriginal adults were over represented in admissions to provincial and territorial correctional services, as they accounted for 26% of admissions while representing about 3% of the Canadian adult population. The findings for provincial and territorial custodial admissions (27%) were similar to community admissions (24%). The over representation of Aboriginal adults was more pronounced for females than males. Aboriginal females accounted for 38% of female admissions to provincial and territorial sentenced custody, while the comparable figure for Aboriginal males was 26%. In the federal correctional services, Aboriginal females accounted for 31% of female admissions to sentenced custody, while the figure for Aboriginal males was 23%. Read: What are Gladue Reports? Children in Aboriginal families also have high rates of unintentional injuries and early deaths from drowning and other causes. According to Health Canada statistics, Aboriginal children are three to four times more likely to die from unintentional injury than non-Aboriginal children of the same age. If you are interested in more information on the key issues for Aboriginal people in Canada, "8 Basic Barriers to Aboriginal Employment"
Interested in learning more about the impacts of the Indian Act? This little book is a great place to start.